Recovering a Rocking Chair and Cute Nursery! 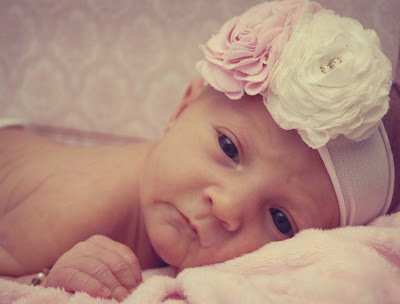 My brother Stetson and sister in law Holly recently had a sweet sweet baby girl, Eliza Mae Banks She is the cutest thing ever! She is such a doll. A few weeks before Eliza was born, Holly found a rocking chair on craigslist and I helped her recover it. I believe Holly found this rocker from Craigslist for only $10. Then, we measured out the fabric to start stapling. I used an air compressor staple gun to staple on the fabric. 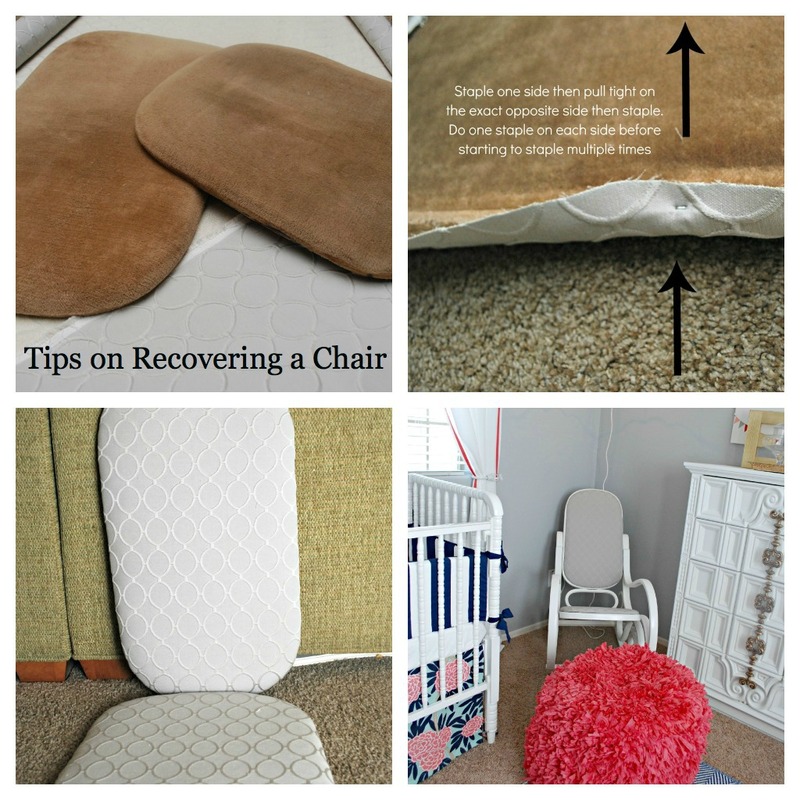 Make sure to pull tight around the whole cushion but not too tight or else the fabric will ripple. 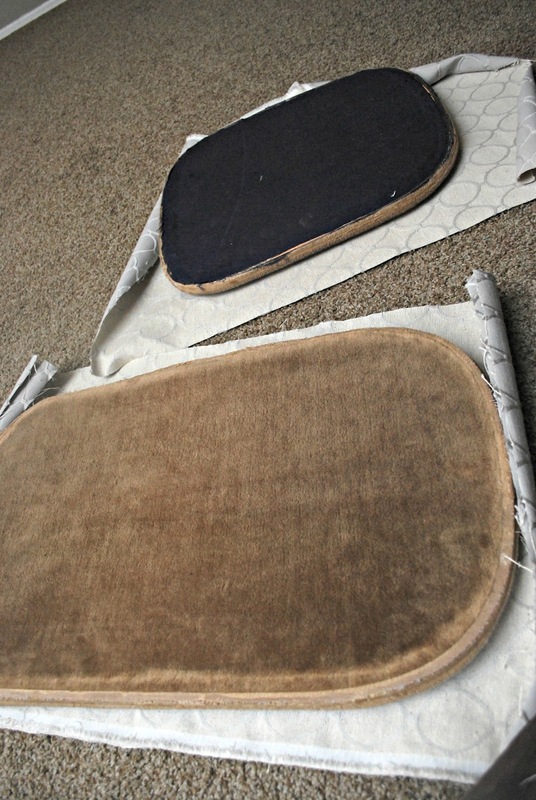 After stapling around the whole chair we cut off the extra fabric. place the staples would not be seen. Here is the cute chair in the nursery. 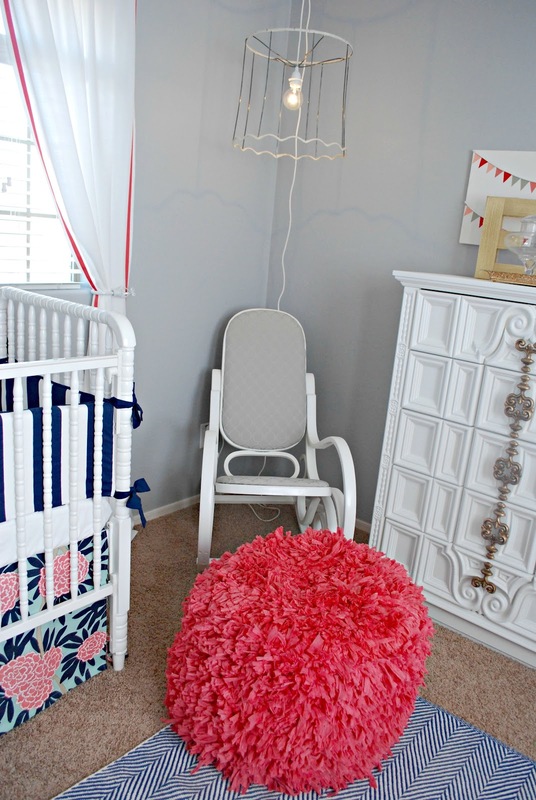 The nursery turned out really really cute. There is one wall that I did not get pictures of because it was a photo collage wall and it is not finished yet but it will be very cute. 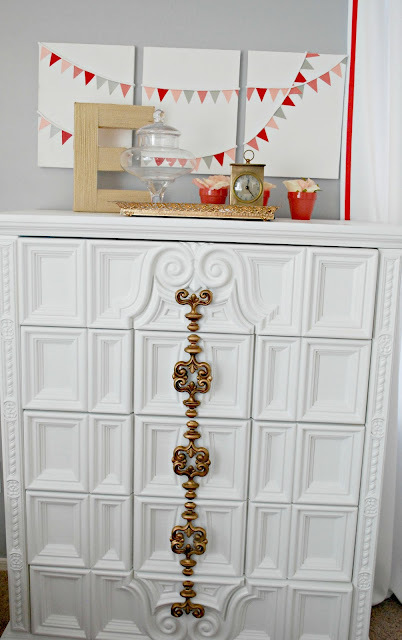 The changing table is on the that wall and Holly painted it a coral color.Love it! All the furniture is second hand and was painted by Holly! P.S. did you notice the cute “Eliza” sign… I made that cute banner for Holly’s baby shower. I used German Glass and old school white glue on chip board letters from Hobby Lobby. Loved how it turned out! If you get the really German Glitter Glass it will age perfectly around the edges! Everyone needs to get there hands on some german glitter glass! 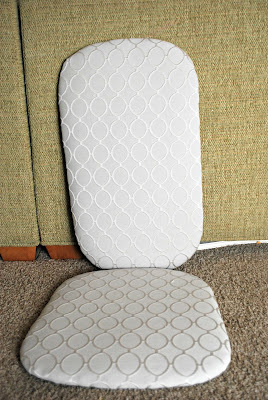 Now go get a cute chair to redo! I have never heard of German glass before…you have peaked my curiosity! And what a fantastic job you guys did of the whole room. I can’t get over that dresser…it’s gorgeous!! 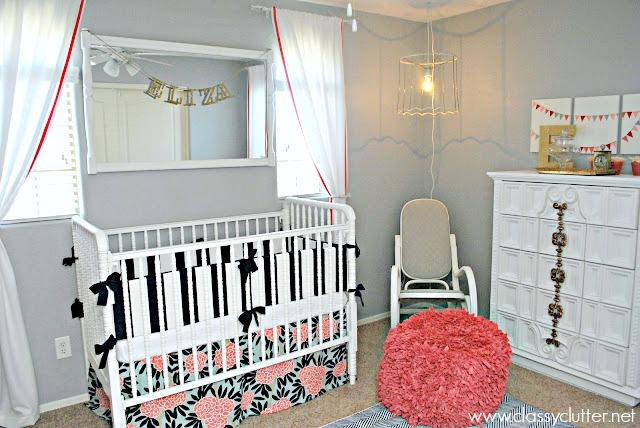 Love the room, but honestly it scares me to death that they have that big huge mirror right above the crib…so scary! Wish they’d move it…. So funny thing just happened… I was reading this and I’m pretty sure Stetson is my husband’s cousin. Is Elizabeth your mom? That’s SO funny. What a small world!! Yes Elizabeth is my mom… Very small world!!! Who is your husband? She is precious & love the room! Awesome job on the rocker. 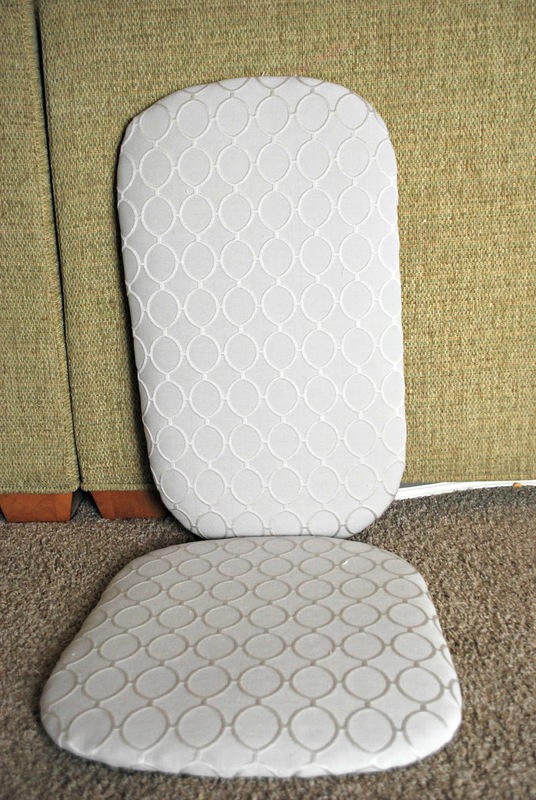 I love seeing more and more moms taking on recovering an old rocker. Classy Clutter indeed! Amazing work.Hats off to the two of you for doing such a great job.Love from India.